Submitted by robataka on Thu, 12/08/2005 - 08:52. 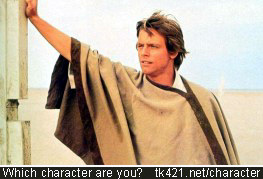 Saw a link to a personality test over at Japundit, which matches you to a science fiction character. I normally don't do these things, but being a science fiction fan, I figured what the heck, let's give it a whirl. hmmmm. here are my results. Click on the pic to take your test. Submitted by Norm Roulet on Thu, 12/08/2005 - 12:05. Nice, quick and pretty interesting survey - I'm not into sci-fi but I like this analysis... looks like 100,000s have taken the survey around the world. So, I'm some guy from Babylon 5 named John Sheridan... who are you? Submitted by Sudhir Kade on Thu, 12/08/2005 - 12:32. Submitted by Evelyn Kiefer on Fri, 12/09/2005 - 20:36. Submitted by Michael Lehto on Wed, 12/21/2005 - 16:53. The test of personality very interesting results have found... so says Yoda, anyway. Submitted by Norm Roulet on Wed, 12/28/2005 - 19:01. Very interesting - Charlie at AJ Rocco's is a Yoda as well. 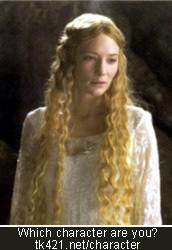 I think as part of the user profiles we should offer the SciFi character test... eventually we'll know if Galadriels and Sheridans make a good love connection, and who goes better with Yodas. John Sheridan, to "create the world we will live in." Submitted by Norm Roulet on Sat, 07/15/2006 - 22:27. An experienced survivor who has maneuvered around many obstacles, you are looked up to by those who rely on your good judgment. In the last few years, we've stumbled. We stumbled at the death of the president, the war, and on and on. When you stumble a lot you tend to look at your feet. Now we have to make people lift their eyes back to the horizon and see the line of ancestors behind us saying, "Make my life have meaning," and to our inheritors before us saying, "create the world we will live in." 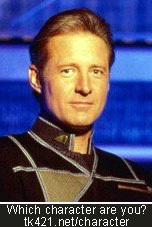 John is a character in the Babylon 5 universe. You can read his biography at the Worlds of JMS fansite. An accomplished diplomat who can virtually do no wrong, you sometimes know it is best to rely on the council of others while holding the reins. There are some words which I have known since I was a schoolboy. "With the first link, the chain is forged. The first speech censored, the first thought forbidden, the first freedom denied, chains us all irrevocably." These words were uttered by Judge Aaron Satie -- as a wisdom, and warning. The first time any man's freedom is trodden on, we're all damaged. 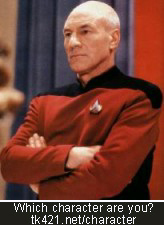 Jean-Luc is a character in the Star Trek universe. This The Next Generation fan site has an outline of his career. Submitted by Phillip Williams on Sat, 07/15/2006 - 23:02. Submitted by Norm Roulet on Sat, 07/15/2006 - 23:13. A venerated sage with vast power and knowledge, you gently guide forces around you while serving as a champion of the light. Judge me by my size, do you? And well you should not - for my ally is the Force. And a powerful ally it is. Life creates it, makes it grow. Its energy surrounds us, and binds us. Luminescent beings are we, not this crude matter! You must feel the Force around you, everywhere. 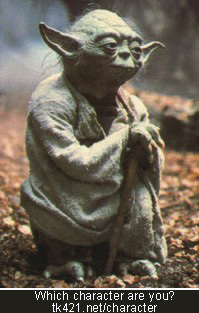 Yoda is a is a character in the Star Wars universe. More Yoda information is available at the Star Wars Databank. New Mexico State - House Agriculture Committee has passed Historic Bill HB 565 for licensing the growing of “Industrial Hemp"